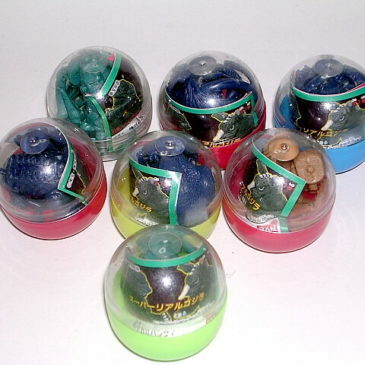 This is a RARE set of High Grade Capsule Figures aka Gashapon toys produced by Bandai in 1993. The set is in its ORIGINAL Capsules with paperwork and have not been put together. The figures are solid heavy vinyl and produced in a single color. The monsters in the set are: Godzilla, King Ghidorah, Gigan, Angilas, Rodan, Mechagodzila 1974 style and Baragon. The figures must be assembled and stand approximately 2 inches high. Clawmark Toys Warning Not Recommended for young children due to parts. FOUR DIFFERENT SUPER DEFORMED KAIJU!! 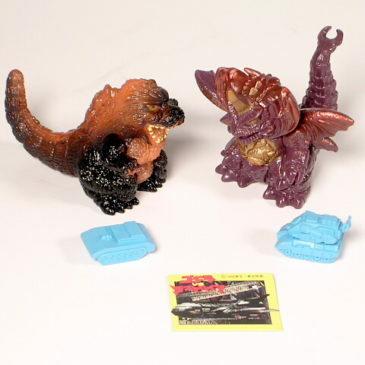 These “FINGER PUPPETS” come from different sets of SUPER DEFORMED KAIJU both Godzilla and his MAJOR FOES! The set includes DESTROYER (DESTROYA), MECHAKING GHIDORAH, SPACE GODZILLA and a HEISEI GODZILLA! These wonderful soft vinyl Finger Puppets stand approx. 2 inches tall and are hollow so you can put them on the ends of your fingers to do BATTLE. CLAWMARK TOYS WARNING: PLAYING WITH FINGER PUPPETS CAN BE HABIT FORMING AND FUNNNNNNNNNNNNN! 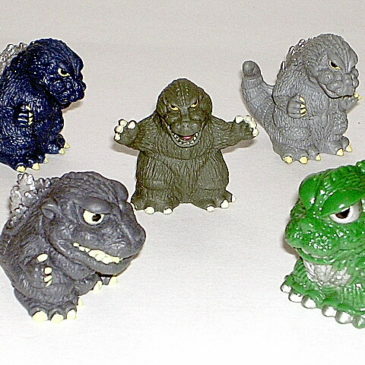 FIVE DIFFERENT SUPER DEFORMED GODZILLAS!! 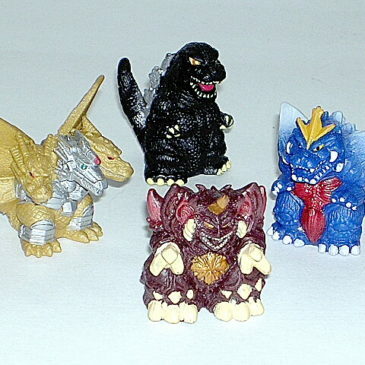 These “FINGER PUPPETS” come from different sets of SUPER DEFORMED Godzillas. 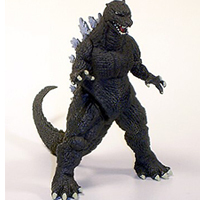 The set includes Godzlla 1954, two different Godzilla 1962s, and two different colored Godzilla 1964s. These wonderful soft vinyl Finger Puppets stand approx. 2 inches tall and are hollow so you can put them on the ends of your fingers to do BATTLE. This 4 individual box set of Super Deformed Figures made by Konami in 2002 is LOTS of Monster FUN!! 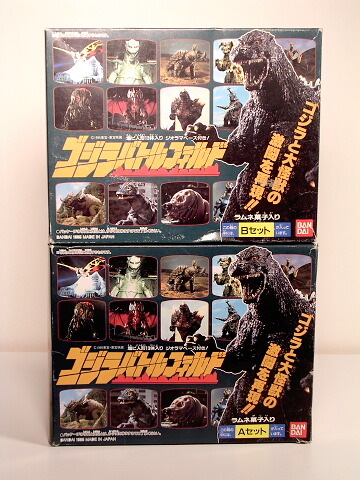 Series 01 Box contains a Godzilla 2003 with 3 mini buildings and a spring loaded shooter which sends it zooming across the floor. Series 02 box contains a Mechagodzilla 2003 with 3 mini buildings and another spring loaded shooter. Series 03 box contains King Ghidorah, Godzilla 1954 and Angilas and comes with a blue plastic mini Oxygen Destroyer. 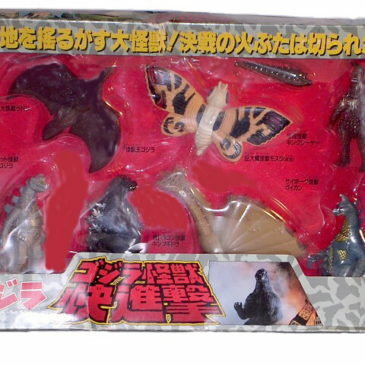 Series 04 Box contains Godzilla 1964, Mothra Adult, Mothra Larva and Mothra Egg. 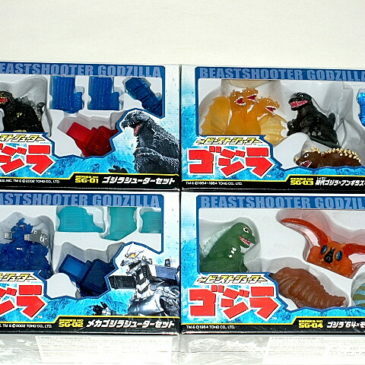 This FUN Shooter Set is designed to be used with the Spring Loaded”Shooter” that comes with the Godzilla and MechaGodzilla 2003 Shooter Set. They can also be SHOT ACROSS THE ROOM with the Flick of a little finger!! All the Super Deformed figures stand approx. 2 inches tall and have a BALL BEARING under them that they roll on. 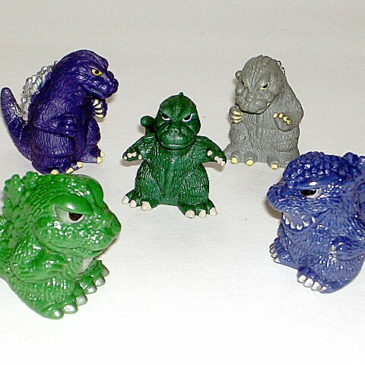 This wonderful Set of 9 “Super Deformed” figures was made for hours and hours of GODZILLA FUNNNNNNNNNN! Produced in 2002 it comes mint in boxes. From The Dawn of the Dinosaurs Exhibit at the Mori Art Center in Tokyo come this series of small dinosaur figures. The dinosaurs are from those that are featured in the exhibit. 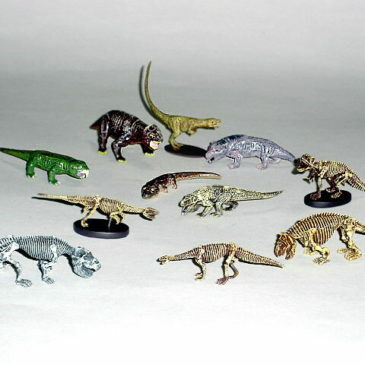 THIS IS THE ENTIRE SET OF 11 DINOSAURUS. The figures include Exaeretodon frenguelli, exaeretodon frenguelli skeleton, Saurosuchus galilei, Ischigualastia jenseni, Ischigualastia jenseni Skeleton, Scaphonyx sanjuanensis, Promastodansaurus bellmanni, Frenguellisaurus ischigualastensis, Frenguellisaurus ischigualastensis Skeleton, Fasolasuchus tenax and the Lessemsaurus sauopaides! These mini figures are ONLY AVAILABLE at the exhibit and come in a capsule from a machine. When you put your money in there is no way to know which figure you will receive. We have worked hard to offer THE ENTIRE SET to you! The figures are made of a hard PVC. Each figure is approximately 2 inches long. Some in the series are a little longer. WE HAVE A VERY LIMITED SUPPLY OF COMPLETE SETS AVAILABLE! Set comes with official paperwork. Clawmark Toys Warning: Not recommended for very young children due to size of toy. Bandai 1996. This is a RARE two box set of 28 mini figures of Godzilla and Friends and Foes. In addition each box contains one part of a circular mini cityscape for you to stage monster battles! Just snap them together and let it begin! The figures stand about 1 1/2 inches. The two boxes on this vintage piece have been opened; all the contents are intact. Bandai 1992. 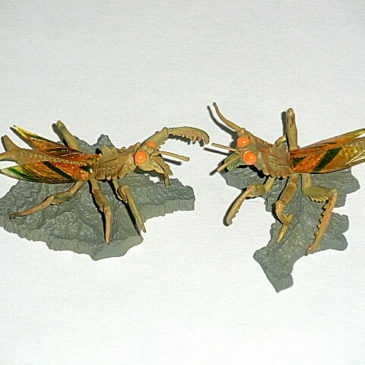 Great box set of Flying Rodan, Mothra, Mothra Larva, King Seesar, Gigan, King Ghidorah, Mechagodzilla & Godzilla Figures range in size from King Ghidra 6 inches to Mothra Larva 2 inches. Vintage piece; Good Box OUT OF STOCK!